Two Indian cities have made it to the top 20 cities that attracted the most venture capital in high tech startups, according to a new report. Mumbai was placed at No. 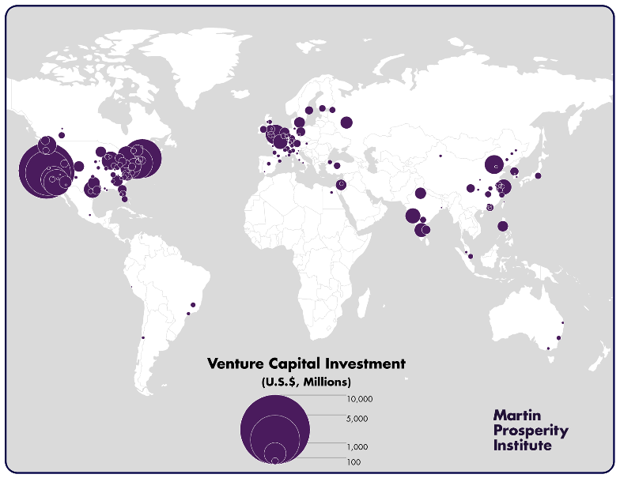 15 with $ 497 million of venture capital raised, followed closely by Bangalore at no. 17 with $ 419 million raised. Predictably, San Francisco occupied the top spot having raised over 6 billion dollars. According to the report, the U.S. is the world’s dominant center for venture capital, accounting for nearly 70 percent (68.6 percent) of total global venture capital, followed by Asia and Europe with roughly 14 percent each (14.4 percent for Asia and 13.5 percent for Europe). India and China’s growing economic clout was apparent in the report dominated largely by first world nations. China managed a top 10 spot with Beijing coming in at no. 9. Shanghai was placed 14th. Bangalore and Mumbai have emerged as two of India’s foremost startup hubs. India’s highest valued startup, Flipkart, is headquartered at Bangalore, as are other unicorns including Inmobi and Ola. Mumbai is home to Powai valley, and houses startups like Housing and TinyOwl. Interestingly, Ola had started off in Mumbai, but shifted base to Bangalore as the company expanded.